One chunk can hold multiple commands. The most efficient (performance wise) is to allocate large enough chunk that it does not expand when you continue to add commands before it can playback. You will save this memory expanding cost. On your ECB you can set MinimumChunkSize which is 4 * 1024 bytes by default (preview 21). Commands like create, destroy, and instantiate the size is fixed. But variable sized command is the command with payload like Add or Set, in that case the command has to hold what you want to set from threads back to main thread. 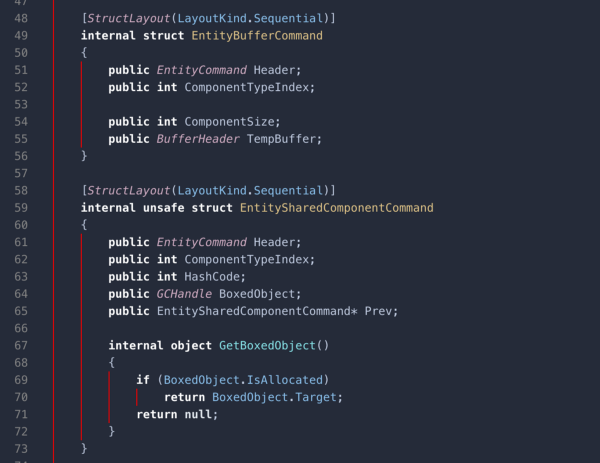 This is such as instantiate and destroy, it needs an entity to do work. 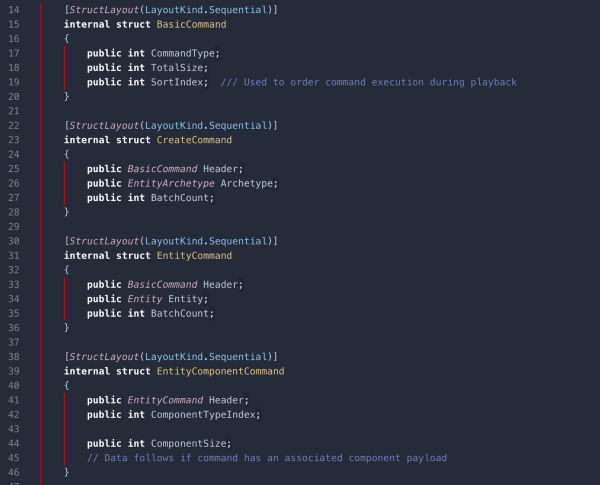 For Remove component command you save the payload, so that’s just 32. Commands with payload : 32 + ??? So you can think just this : will it go over 4096 before it can playback? If it is, increase minimum chunk size. Just create or destroy : about 170 commands. Add/set commands with payload : Typical IComponentData may sized average around 5 integers? In that case you got about 80 commands. Currently you must stare at your code to estimate command count at barriers. I hope Entity Debugger could display some useful information at the barrier in the future. ps. For SharedComponentData addition with ECB it seems to not care about your payload size since it box that object and just make it a pointer and a hash. Burst and the generated assemblies : how smart is it? Jobs aren't always the fastest for all operations. EntityManager operation mostly have to cause structural change on the main thread. Let's see how we could speed this up.